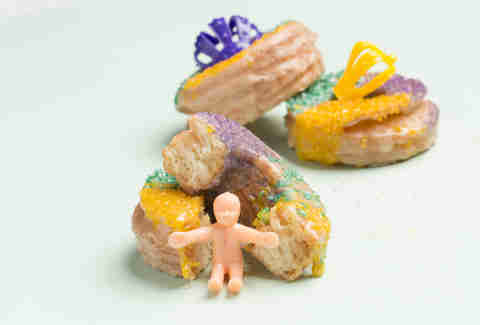 There's no better fatty and festive food than New Orleans' iconic king cake, the braided Danish dough that's coated with icing and sprinkles, and typically harbors a plastic baby doll (wisely inserted after baking). 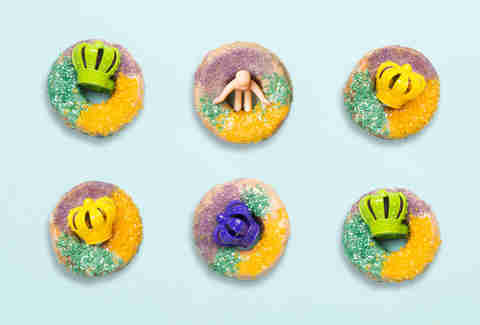 That is until now, with the introduction of the king cake donut. This recipe, developed by chef Alfredo Nogueira of Analogue in Chicago, makes the cinnamon-sugary cake portable for gluttony on the go. Combine flours, yeast, ¼ cup sugar, and salt in the bowl of a stand mixer; mix on low for 2 minutes. Add milk and eggs; mix for another 2 minutes. Add butter, increase speed to medium; mix for 3 minutes. Reduce speed to low and continue mixing for another 5 minutes. In the meantime, combine remaining 1 cup sugar and cinnamon in a small bowl. Transfer dough to a floured work surface and roll it out into a rectangle. Sprinkle cinnamon-sugar mixture in an even layer on the dough. Fold dough into thirds, like a brochure, and roll again. Fold dough one more time into thirds and place it on a baking sheet; refrigerate overnight. The next day, place dough on a floured work surface and roll it out to ½-inch thickness. Cut it with a donut cutter or cookie cutters. Place donuts back on the baking sheet, cover with a kitchen towel, and let rest in a warm place for 30 minutes. Preheat oil to 350℉ and fry a few donuts at a time, 4 minutes each side. Transfer to a wire rack to cool for 7-10 minutes. To make the icing, whisk together all ingredients in a mixing bowl. Once donuts are cooled, dunk them in the icing one at a time. Let the first layer harden, then dunk again. 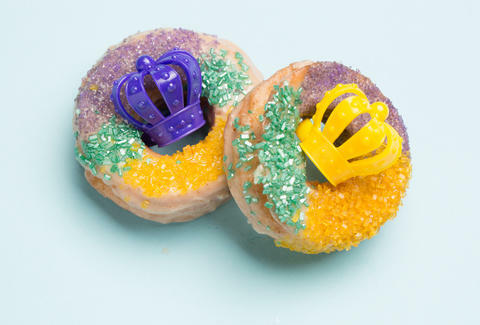 Immediately decorate donuts with purple, green, and yellow sprinkles. Senior editor Sean Cooley is a big fan of churro ice cream sandwiches and has a Google alert for "Nic Cage to star in next Fast & Furious movie." His half-baked musings are tweeted at @SeanCooley.